Stepan Timofeyev – Timofeyev, or Timo for short, joined the GMHL at the deadline in 2015-2016 with the Tottenham Steam. He immediately became an impact player for the Steam, helping them finish #1 in the GMHL in the Regular Season, and helping them win the Russell Cup in the playoffs, where he was voted Playoff MVP. He was traded in the offseason to the Bradford Rattlers for the 2016-2017 season, where he became Captain for the team. His productivity from the following season rolled over into the 2016-2017 season, and he put up a stat line of 38 Goals 69 Assists for 107 Points in 37 Regular Season Games Played, unfortunately the Rattlers didn’t have playoff success and were ousted in the first round. Individually though Timo was named a GMHL All-Star and was voted the GMHL MVP for the North Division. Following his GMHL tenure, Timo advanced to the FHL. Unfortunately in 2017-2018 he was unable to play a full season and reach his full potential. This season though, he has played for a majority of the season, and his production has soared. In 41 Games Played, Timo scored 14 Goals 47 Assists for 61 Points, and the FHL has recognized him as one of the Forwards of the Year, as well as the Rookie of the Year. Congratulations Timo! Glen Patterson – Patterson played three full seasons in the GMHL, playing with the Bobcaygeon Bucks. He was immediately an impact player for the Bucks in 2010-2011, scoring 51 Points in his rookie campaign, and helping the Bucks to their best franchise finish. The following season Patterson continued his productivity scoring 64 Points for the Bucks, and was named Assistant Captain for the team. In his final year with the Bucks, Patterson scored 49 Points, and won the GMHL Most Sportsmanlike Award. 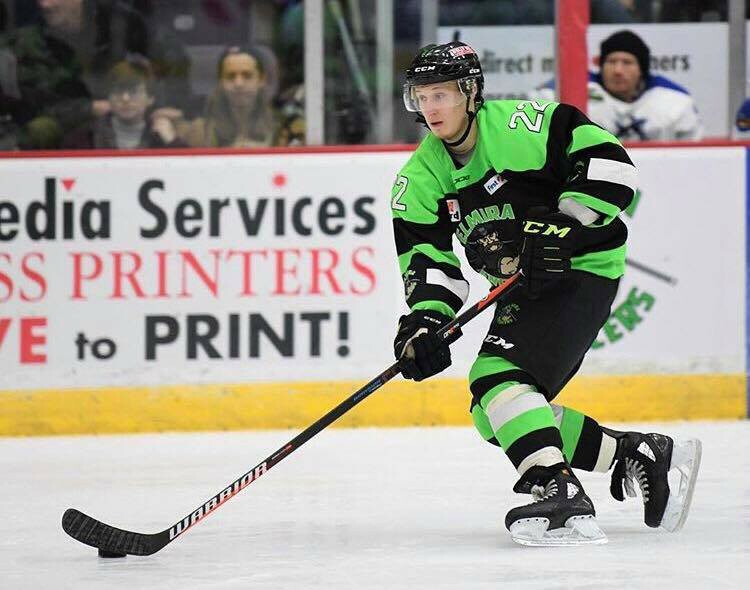 After three full seasons in the GMHL, Patterson was ready to make the jump to professional hockey. He first went to the NZIHL in 2013-2014, a professional league in New Zealand, where he put up 22 Points in 14 Games. Then he moved on to Sweden, where he would play three seasons at the Division 2 level. His first year of Division 2, he was named Assistant Captain, and scored 13 Points in 27 Games Played. His next year he upped his production and was almost a point per a game, scoring 19 Points in 20 Games Played. In 2016-2017, Patterson began the year in Sweden Division 2, before he came back to North America, playing in the SPHL. As a seasoned junior and professional veteran, Patterson was signed by the Danville Dashers in the FHL for the 2017-2018 season, where he would score 4 Goals 20 Assists for 24 Points in 52 Games Played. He had a breakout year in the FHL this year though, where put up a stat line of 12 Goals 37 Assists for 49 Points in 53 Games Played. The FHL has recognized him as one of the Defencemen of the Year, Congratulations Glen! Kyle Powell – Powell joined the GMHL for the 2015-2016 Season, where he played for the Oshawa Riverkings in their first season as a franchise. Powell would be named as the first Captain in Riverkings history. Powell had an incredible year with the Riverkings, where he managed to break the 100 Point mark, scoring 51 Goals 54 Assists for 105 Points in 38 Games Played, which led to him becoming named a GMHL All-Star. Throughout his season with the Riverkings, Powell was called up to the FHL by the Danbury Titans as well; playing a total of 10 Games in the FHL. In 2016-2017, Powell made the jump to the professional level permanently, signing with the Watertown Wolves, where he has played ever since. While productive in his rookie campaign, it was really his sophomore season that stands out. He put up the most points as a defenceman (61), which led to him being voted Defenceman of the Year. To top it all off, the Watertown Wolves would go on to win the Championship. After such a great season, it’s hard to follow up the following year, however, that’s what Powell did, scoring 56 Points, and winning Defenceman of the Year again. The only thing that remains to be seen is whether his team can repeat as Champions. Either way, congratulations Kyle! Christian Pavlas – Pavlas made a brief stop in the GMHL in 2017-2018, spending time with the Kingsville Kings. Pavlas only made one start with the Kings, before he was called up by the Kings FHL affiliate, the North Shore Knights, where he would go on to play 14 Games, obviously making an impression, because he was dealt to the Carolina Thunderbirds, where he has since taken on the starting role. His Save Percentage has consistently gone up over the past three seasons, but his GAA this season has made him the undisputed number one in the FHL, putting up a stat line of 1.69 GAA and .934 S%. Although Pavlas time in the GMHL was brief, we’d still like to offer our congratulations on winning Goalie of the Year! The FHL is one of five professional leagues in the United States, and has promoted over 170 players to various 'AA' (or higher) leagues including the ECHL, CHL, and AHL. The GMHL is proud to see that it’s alumni are not only playing at this level of hockey, but succeeding and being recognized for their success. Congratulations to all four of these players, and we wish them all the best in the future!